In “Die Fighting,” a team of Shaolin-trained kung fu actors are about to make their big break in Hollywood when a shady director forces them through a gauntlet in Los Angeles, forcing them to act and react in a brutal action reality movie, filming their every move as they are pitted against a gallery of thugs. To make their way out of the movie and keep their families alive, they must face every death-defying challenge the director throws at them or be killed in the filming process. A fan of Jackie Chan and Jean Claude Van Damme films among others, Garcia grew up in France with a love for martial arts films. When he was fourteen, he started to train in the traditional art of Vovinam Viet Vo Dao, a Vietnamese martial arts that includes weapons work too. Along with his mixed training in Jiu Jitsu and Vovinam, he learned to incorporate different fighting styles in his competitive fights. It was during his stay in the Shaolin monastery that he met his partners in film production, Laurent Buson and Yannick Van Damm. “They were going inside the monastery when I was leaving and we quickly became friends. Yannick Van Dam was a few years ahead of us so he was our big brother and showed us the ropes. Laurent was in another school and Yannick slept in the monastery since he was already one of the monks’ disciples,” recalls Garcia. 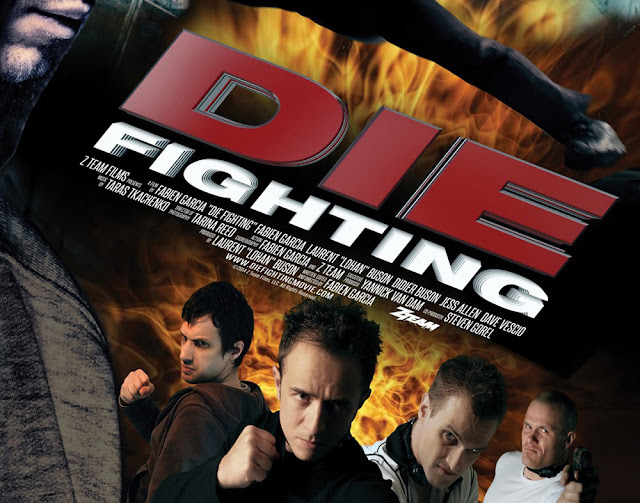 “Die Fighting” opens July 15 in cinemas from Crystalsky Multimedia.